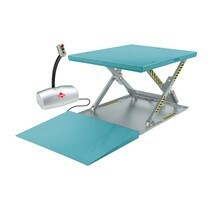 The Ameise® U-shaped flat scissor lift table is supplied with plug, meaning that it is immediately ready for use. 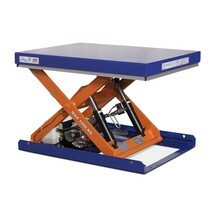 The low height makes the Ameise® U-shaped flat scissor lift table particularly flexible. Thanks to the safety bolts with lifting eyes, the table can be transported to the required location with a forklift truck or crane. 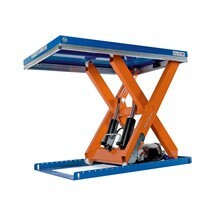 When fully lowered, the lift table has a height of 80 mm, allowing it to be stored in a space-saving manner. The U-shaped opening in the platform provides perfect access for a pallet or forklift truck when loading or unloading. 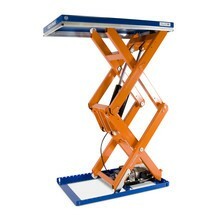 This allows you to deposit pallets or pallet cages on the platform both quickly and safely. You control the device via the key switch on the control unit. Thanks to its robust construction with stable scissor bracing, the lift table can support weights of up to 1000 kg, provided that the load is evenly distributed. Multiple measures are in place for your safety. The base plate features a raised edge, which not only offers foot protection for the operator but also ensures safe guidance of the scissor lift rollers. To prevent crushing injuries, a foot protection contact strip below the platform ensures that the lowering motion of the lift table is halted immediately if any contact is made. In addition, the emergency disconnect on the control unit immediately interrupts the power supply so that the lift table can no longer move. 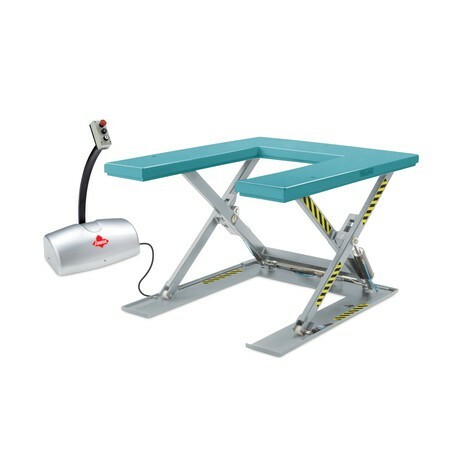 A safety device prevents accidental lowering of the lift table when performing repair or maintenance work. 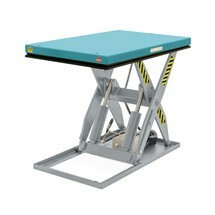 Order the robust and flexible Ameise® U-shaped flat scissor lift table from our shop.